I saw this recipe on The Imagination Tree. If you’re looking for some great activities to do at home with your kids, be sure to check out this blog. There are some fantastic ideas that look like so much fun! 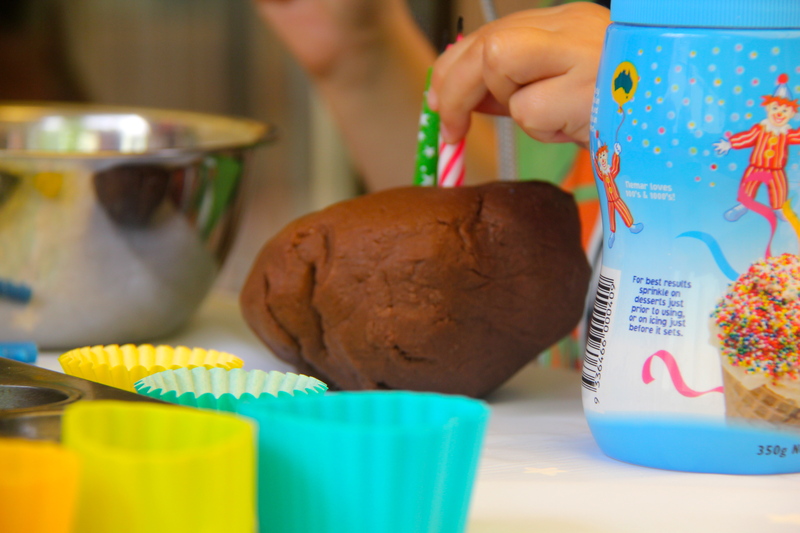 I thought chocolate playdough sounded like something fun to make for Valentines Day, although the play turned into a birthday party – all good :-). I talked in my last post about sensory play being great for brain development. If you’re looking for a different kind of sensory recipe, this is the one for you. It was really quite bizarre when Thomas and I were making it. It smelt delicious and looked like chocolate cake… but it wasn’t. Maybe a bit disappointing because there was no spoon to lick 🙂 but fun none the less. The recipe is no cook (although involves boiling water) and is a really lovely texture. I think we’re going to have a lot of fun with this one in the days to come. Thomas wasn’t really in a playdough mood this morning but his friend H. had a great time making cakes and they both enjoyed singing ‘happy birthday’ to each other. Playdough is a fantastic activity, there are so many learning outcomes that can be achieved through playing with playdough and most children love the experience. 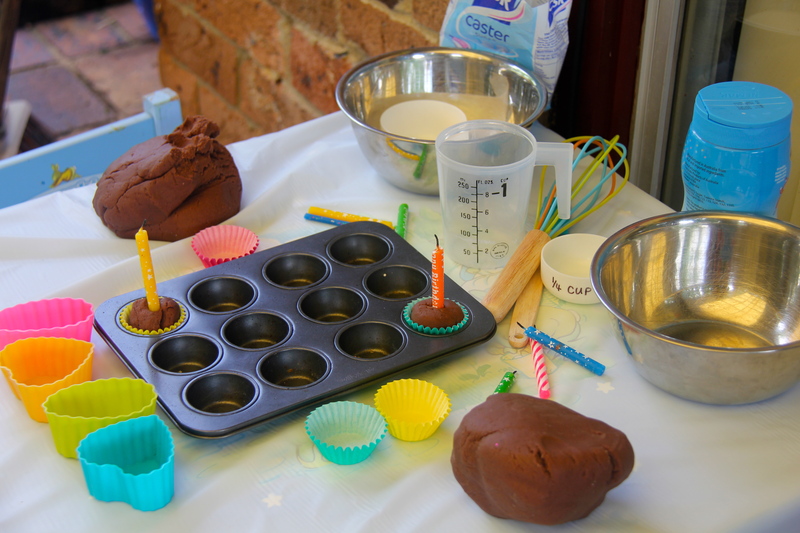 Apart from the sensory aspects of playdough, children are using their fine motor skills, developing their language and literacy skills by taking part in and initiating conversations, basic maths skills (counting, size), colour recognition – there are many more depending on what other aspects your playdough play incorporates too. When it has cooled a little, knead it on a clean surface until it loses all stickiness and becomes smooth and stretchy. No residue should come off on your fingers. If it is still sticky add a little more flour, if too dry and crumbly add more water, a tablespoon at a time. Thomas is getting to a stage where he needs a bit more of a challenge in the kitchen. Something a bit beyond mixing and pouring. For safety reasons, I’m not yet ready to set him free on the stove so we decided to go with the much safer option of washing up. We all want our children to grow into responsible adults and therefore it is important to start teaching them responsibility from an early age. Some might argue that we should let kids just be kids and that they have plenty of time to be doing chores when they are a bit older but toddlers and preschoolers enjoy imitating adults. It is how they learn. To them, taking the broom and sweeping isn’t work, it is part of play and learning. Thomas already loves cooking so I thought that teaching him to clean up after we have finished cooking was a way of beginning to teach him some responsibility. He loved playing in the water in the sink with some bubbles and he really felt a sense of achievement when he had finished. He was very proud. This simple sensory task not only teaches children responsibility but helps to develop fine motor skills, colour recognition and bi-lateral co ordination. Use warm water (test the water before allowing your child to start washing up) and a little detergent. At first you will need to show your child what to do but with a little practice they will be experts! * putting away the shopping – again helping develop classification skills. Thomas loves to help with this. I give him things to put in the bathroom while I get the bulk of the shopping away. Admittedly, I find all the things in the doorway and then have to put them away but he loves to help. * sweeping/washing the floors – great for gross motor skills and hand eye co ordination. Give your child the dustpan and brush after they have eaten lunch to pick up any crumbs they may have dropped. Thomas is really interested in signs and what things say at the moment. This is a developmental stage in early literacy development where children realise that print carries a message. They begin to recognise writing as a pattern and will often start to experiment with trying to ‘write’ words on their own drawings. This concept, usually develops in children 2-3 years and is the beginning of getting ready to read. Along with gaining an awareness of print, Thomas is also recognising numbers in the environment. He is able to recognise his number 1-9 and will identify numbers he is seeing in the environment. This is a very exciting stage of development. 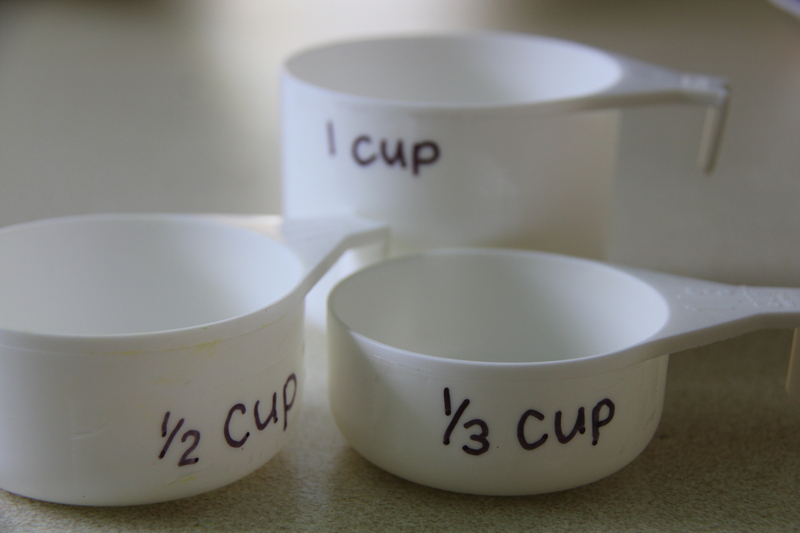 To further extend this awareness of numbers in the kitchen, I have labelled our measuring cups clearly so he can begin to identify to measurements on them. This is really simple to do. Ensure your measuring cups are clean and dry. Place a small amount of tape on the side of each of the measuring cups and label with correct measurement using the texta. The labels may start to wash off but they can be easily replaced. Use the cups when you are cooking. Ask you child to find the one that says “1/3 cup” etc. Discuss with them which one is bigger so they begin to see the variations in size. Children will be learning number recognition, size concepts, fraction awareness not to mention all the skills they learn from the cooking experience. This one is for those of you who have an iPad or iPhone (and like to let your kids use them…). I found this app and whilst I thought was a little bit difficult for Thomas, I thought that he would really enjoy it. 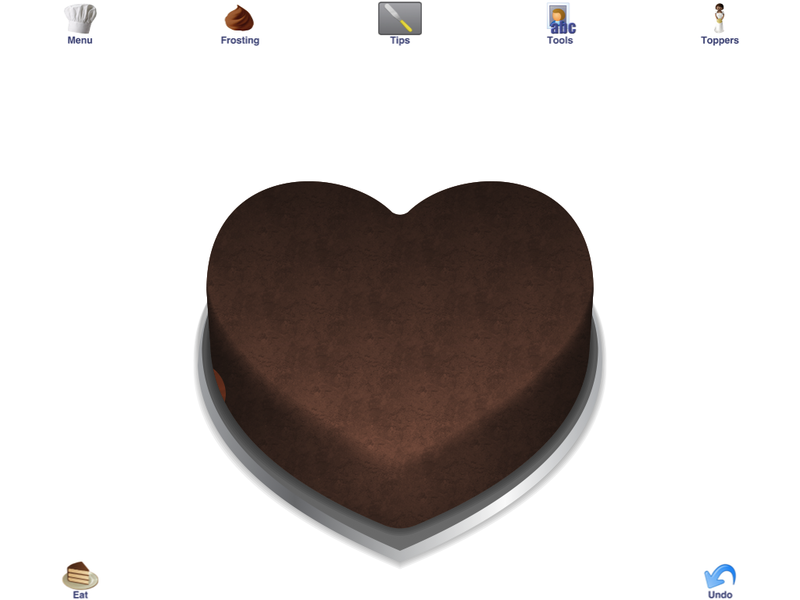 It’s a great little app with lots to do – and no mess! 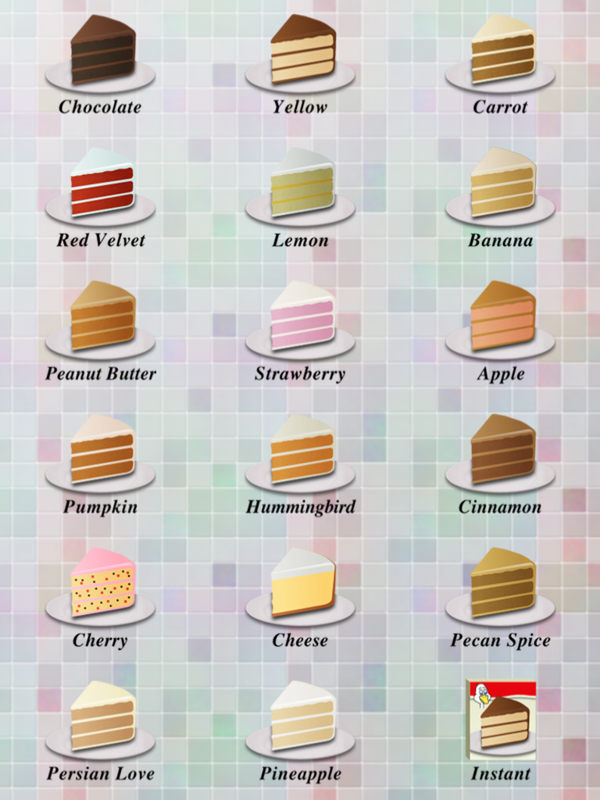 You choose what sort of cake you’d like to make (you can even do a packet mix where you just put it straight in the oven). Then you drag all your ingredients into the bowl. You have to sift the flour and crack the eggs, pour the milk. It’s very hands on. 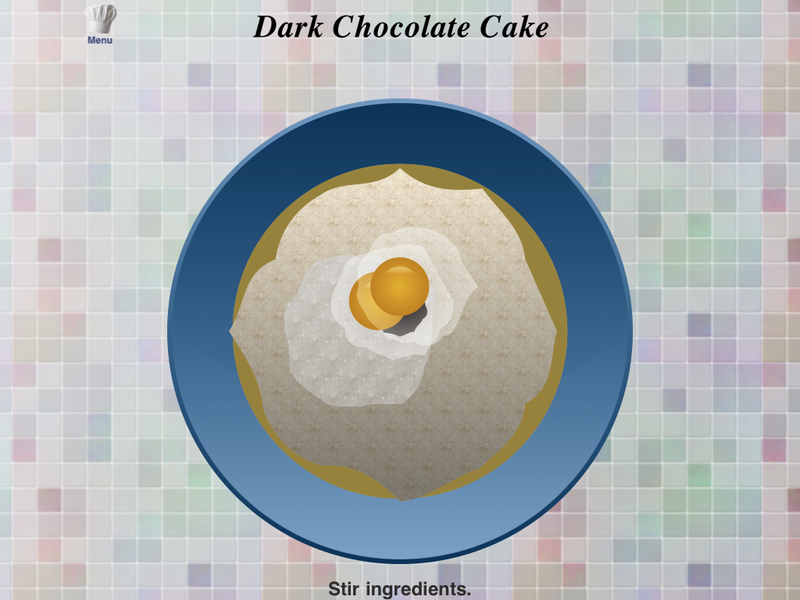 You mix the ingredients together by moving your finger around on the screen. Then you drag your cake into the oven. Once it is cooked you get to ice it any colour you like, you can put little decorations on it and then you eat it by tapping the screen. The only thing I will say about this app is that there is no verbal instructions about what to do within the app so you do need to help your child by telling them what to do until they become familiar with it. It costs $0.99. There are other similar applications but this is the only one I have tried. I know there’s lots of debate about using this kind of technology with kids but I can’t tell you how much Thomas has gotten out of using applications like this one. It has helped his hand eye co-ordination, his concentration, his ability to scan a page (or screen) to look for objects which is an important skill in learning to read, he is even starting to recognise some familiar words. I don’t leave him to his own devices and use it as a babysitter, I am always there with him and talking him through what he is doing. This sort of technology is the future. I had an idea to extend our banana smoothie making activity today (yes we still make them almost every day for afternoon tea). I did this many years ago when I was working in child care and thought I might do a more updated version for Thomas. As I have talked about before, it is a great literacy experience to get children involved in reading a recipe when cooking. 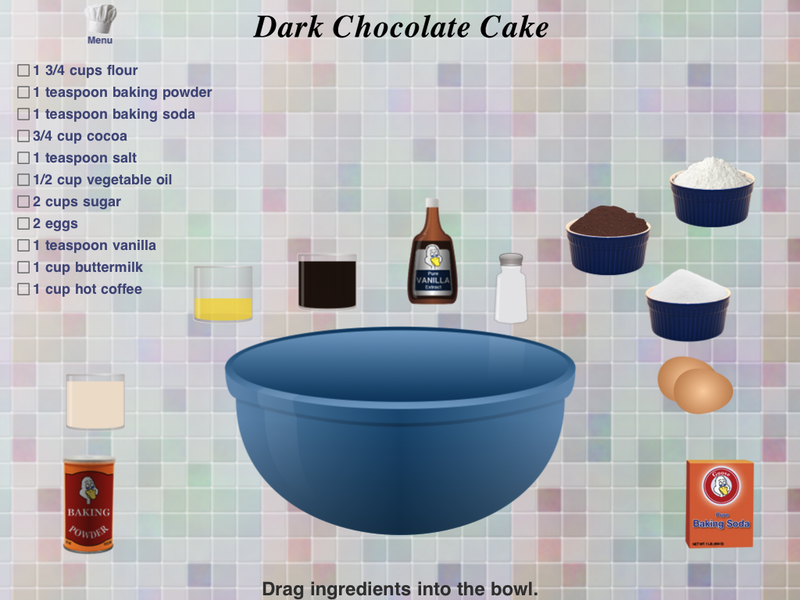 This kid friendly version will help them to become familiar with a recipe and what is written in one. It will also give them a great sense of achievement in being able to ‘read’ it for themselves. There are 2 links to it here, print it out and give it a go with your child. I’d love to hear your feedback.